Oregano is a member of the mint family and is often called wild marjoram. It is also known as the “pizza” herb due to one of its most popular uses. In the Greek language, it means “joy of the mountain,” and along with basil is a hearty addition to tomato-based recipes. Greek oregano is the standard species. There are many other plants that are called oregano, but do not belong to the same family. For instance, Mexican oregano, which is a staple in chili powder mixes, is no relation. The two are interchangeable, although the Mexican version is bolder in taste. True marjoram, while in the same family as the Greek variety, tastes and smells nothing like oregano. When buying fresh, select bunches with healthy green leaves that are perky. You can easily grow your own and enjoy the added benefit of truly fresh flavors. Place in a sunny window during cooler months and set outside for summer. The only precautionary measure is to remove buds before they bloom or the leaves will develop a bitter taste. 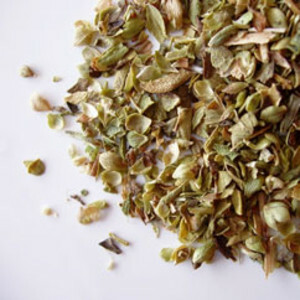 Like similar herbs, commercially processed oregano – either crushed or ground - will keep in dried form for about six months before flavor begins to deteriorate. Fresh bunches should be wrapped in a damp paper towel, bagged, and kept in the refrigerator. They will be good for 3-4 days. Consider dehydrating if not used in that time. When stored in an airtight container the dried leaves will be good for up to a year. Leave the stems intact to conserve the oils. Leaves can also be frozen, but the texture will change and flavor will diminish. In addition to its use as a preferred pizza topping, oregano can improve flavor in a variety of dishes. It’s especially tasty in any recipe that uses tomatoes and/or garlic. Oregano can easily overpower some dishes, so use with care. Soups, particularly those that include beans of any kind. Fresh oregano has a more subtle flavor than dried. Use about one-third to one-half less of dried in recipes. Basil and thyme are adequate alternatives.